Rebellious Jukebox: How Do You Find My Sister? This is one of the strangest records that I've bought for quite some time. I don't actually have a physical copy yet; this review is based on the download version that was made available to those who pre-ordered the album. 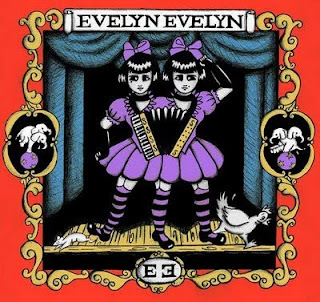 Evelyn Evelyn is the project of a pair of conjoined twin sisters, both of whom are called Evelyn Neville. The twins were born in Kansas in 1985, and share between them three legs and two arms. Their mother died giving birth to them and their father was killed in a tragic accident soon afterwards. 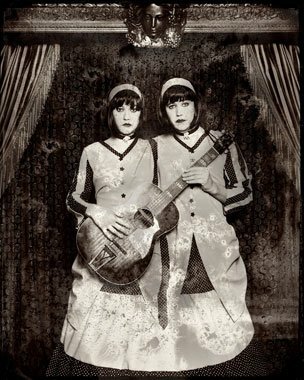 Realising that they would never be able to live conventional lives like the girls around them, the twins soon turned to music and became proficient in a number of instruments. On this album, they play ukulele, piano, guitar and accordion. This gives the record a kind of Vaudeville cabaret feel, and it's not really like anything else in my collection. The only comparison I can make is with some of the early works of Momus, in particular his album "The Ultraconformist". However, with Momus I always get the impression that it is the work of a man who painstakingly uses his technical skills and modern instruments to create a very precise imitation of an old-fashioned sound. Evelyn and Evelyn's work feels more natural, as if this is the only sound they know and they have no idea what modern music sounds like. The content of the album is entirely autobiographical, depicting the horrors of their birth and early upbringing. There are many unsettling moments as the girls describe the different forms of abuse they suffered from children their own age and also the various adults who were charged with taking care of them. In their adult life, their main problem seems to be how difficult it would be for either of them to have a sexual relationship. This becomes clear on the country-tinged "You Only Want Me 'Cause You Want My Sister". However, elsewhere on the album there are hints that one sister is more promiscuous. On "Have You Seen My Sister Evelyn?" I can almost imagine that one of the twins is constantly having to look the other way, or perhaps even mentally block out what is happening, as her sister flirts with every man she meets. The album ends with a cover of "Love Will Tear Us Apart". The song takes on a new meaning, as the girls seem to be debating whether their sisterly bond would be damaged or strengthened if they were surgically separated so that they could lead individual lives. If you've read this far, you might be starting to question the plausibility of this story. In case you haven't guessed already, Evelyn and Evelyn are fictional characters. They were created by Amanda Palmer, who plays all the songs on the album, with the help of producer Jason Webley. Amanda first mentioned this project more than a year ago, explaining how she had "discovered" the twins and would be helping them to record an album. By the time the release date was announced, most fans had worked out that Evelyn and Evelyn were not real, but another of Amanda's alter egos. To begin with, when people still believed the twins to exist, I saw a lot of comments praising Amanda for the way she was supporting the girls in a genuine way when it would have been easy for her just to exploit them for financial gain. But once the truth became known, posts began to appear on a number of discussion forums, complaining that the "tasteless" background story had spoiled a project that was very interesting musically. In particular, there is an ongoing debate on Amanda's own blog. Amanda has been accused of "ableism" and perpetuating the stereotype that anyone who is different is a "freak". When I first heard about the project, it didn't occur to me that anyone would consider it offensive. I just thought it was another example of Amanda's wonderful imagination. Even after following the controversy for the last few weeks, I can't really see why so many people have a problem with it. I can think of many disabled characters in works of fiction. For example, I don't remember complaints about Dustin Hoffman's portrayal of a man with autism in "Rain Man". Then there is Katherine Dunn's novel "Geek Love", which I read recently. I am now wondering if this book was an inspiration to Amanda when creating Evelyn Evelyn. "Geek Love" was not criticised for its depiction of a family of circus freaks, including a pair of conjoined twins, so I'm not sure why Evelyn Evelyn has received such a negative response. Amanda does not seem to be mocking conjoined twins. The story shows how people with disabilities still suffer discrimination and abuse, but in this case, Evelyn and Evelyn overcome their hardships to become expert musicians, and clearly the most important thing in their lives is their love for each other. It could therefore be held up as a positive example to real conjoined twins, or anyone else with a disability. I'm wondering whether what has upset some people, although they probably wouldn't admit it, is simply the way Amanda tried to pass the twins off as real. I wouldn't be surprised if some fans are aggrieved that they fell for the trick, and are now accusing Amanda of bad taste to make up for how gullible they feel. The project has, however, made me question my own attitudes. For a short time after I first heard about the controversy, I felt slightly guilty and wondered whether I should have spotted that there was something tasteless in the story without others having to point it out to me. I've now realised that I can sometimes be hypocritical when it comes to offensive material. It's not often that I am personally offended by the content of any form of art, but when everybody else is offended, I sometimes feel that I should be too, just to protect my own reputation. A good illustration of this would be the works of Momus, whom I mentioned earlier. Momus also creates fictional characters in his songs, and much of his work is centred around explicit sexual themes, depicting his bizarre fetishes. In his entire back catalogue, there is one song that makes me feel uneasy. I perhaps shouldn't go into details, but some of you will know which song I mean as I have discussed it with a few people in the past. Because the topic covered in the song is one that provokes intense public opinion, but mainly due to the graphic way in which Momus describes the actions of the song's central character, I don't feel comfortable listening to it. But if I am honest, I am probably just concerned about how people would view me if they found that I was listening to something of this nature. While writing this article, I've realised that I need to suppress this hypocritical attitude and be more honest. So just for once, I'm going to stick my neck out and say I don't think there's anything wrong with Evelyn Evelyn, no matter what the rest of Amanda Palmer's fans say. I would be interested to hear what other people think and whether anybody else considers this project to be in poor taste. The crucial thing here is that Evelyn Evelyn is a work of fiction (and pretty obviously, I thought). If guilty of anything it's disability voyeurism or extending the myth of disabled people as different or 'other', the freakshow idea. If Amanda had been dressing up in prosthetics or something, and portraying herself as a disabled person, then that would be a whole different ballgame. The comparable situation here would be a white guy playing the blues 'blacking up' to be somehow more authentic; something that would rightly be condemned. Non-disabled people playing disabled characters still exists in popular culture but is far less common than it used to be, as it becomes increasingly recognised that there are talented disabled actors out there who are able to play these roles and, in so doing, bring far more of an understanding about the nature of disability and impairment that underpins the role than a non-disabled actor would be able to do. "Rain Man" and other films where non-disabled actors play disabled characters ("The Elephant Man", "Coming Home", "Born on 4th July", "What's Eating Gilbert Grape?" etc) *were* largely condemned by disabled theorists, but unless you were a formal or informal student of Disability Studies you were unlikely to encounter these critiques. Interestingly, there are visible disabled people within music (Robert Wyatt, the late Vic Chestnutt, the late Ian Dury, and Kristin Hersh spring instatntly to mind) whose press coverage diverges hugely, either not really addressing the issues of disability (Wyatt) or viewing it as a curio or in terms of pity (as with Dury's Polio and Hersh's much publicised bipolar disorder). It's a tricky issue, though, whether non-disabled people have the right to portray non-disabled people and their lives when they are entirely fictional accounts. Shakespeare did it in many of his plays, and it's a staple of David Lynch's films and TV, but they rarely get criticised for it. I guess it's because Evelyn Evelyn is one of the first examples in music that it's getting so much attention. Voyeurism, whether it be in the songs of Momus, "The Elephant Man", "Lollita" or Channel Five's endless 'documentaries' ("The Boy With An Arse For a Face" and so on), is a central theme of art and popular culture and has been for centuries. We like to imagine what it's like for others, particularly those who we see as 'different', whether those depictions be correct or not. I suspect in most cases, however, the truth is far more mundane than the myth. Thanks for the recommendation, Scott. I will try and track down something by Deux Filles when I get a spare moment. You raised some interesting points, and I was particularly struck by the comment that it's mainly theorists of disability studies who criticise disabled characters in fiction. It was partly the fact that I have no experience of disability studies (and I'm also something of an amateur when it comes to any form of media criticism) that made me wonder if there was something deeper that I was missing in relation to this controversy, so I was concerned that coming out in support of Amanda might highlight my ignorance in this area. However, I would guess that many of the people complaining about Evelyn Evelyn have no direct experience of disability. There are certain topics where the general public feel obliged to make a fuss (see Chris Morris's "Brass Eye" series for further evidence) but I was surprised to find it happening here as I always imagined Amanda Palmer's fans to be above this kind of Daily Mail mentality. It may come as no surprise that I've worked in support roles with disabled people for 17 or 18 years, and that I was a student of Disability Studies and wrote my final year paper on media representations of disability. Evelyn Evelyn could be a wonderful satire, commenting far more on people's fascination with "freaks" than addressing issues of impairment and disability. This is similar to what Chris Morris did with regard to the issue of paedophilia in "Brass Eye". Without knowing Amanda Palmer's motivations, though, I couldn't say whether her work is satiricial or merely adding, intentionally or unintentionally, to the myth of disabled people as objects of ridicule and exploitation.